Peirce-Phelps has developed unique solutionstomeet the needs of a variety of markets includingconsumerelectronics, home appliances, heating, ventilating andairconditioning products, computers, and solid surface countertopproducts. 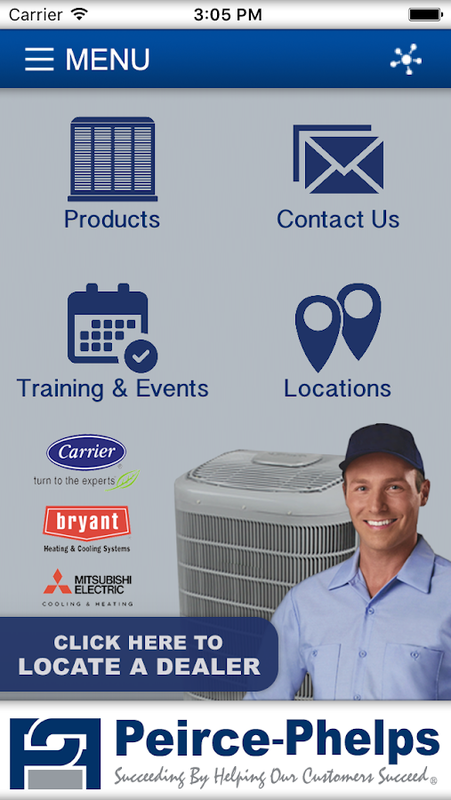 Our business has grown to one of the 50 largest HVAC distributorsinthe country. Peirce-Phelps continues to gain product lines,openHVAC Sales Centers at strategic locations throughout the regionandaggressively expand its residential and commercialcustomerbase. The company remains true to the values of our founders andhasformed business relationships with our customers that spandecadesand generations. Peirce-Phelps has remained successful bybeingflexible and responsive to the ever changing needs of themarket,through deep knowledge of our industries, and by listeningto ourcustomers. Now starting our eightieth year, we remainmorecommitted than ever to this philosophy. We thank you foryourbusiness and look forward to succeeding together inthefuture! Change the way you research and invest in stock market via thebrand new StockAxis app. We are a SEBI registered equity advisoryfirm having more than 3 Lac registered users. We aim to be India’smost trusted equity adviser with our thrust on technical andfundamental research, which is complemented by years of experiencein the Indian stock market. At StockAxis, our mission is simple:First Class Stock Advice, from First Class Research. StockAxis isIndia's only App providing finest research tools for performingAnalysis on Indian Stock Market. Install and explore such researchtools free. Also get latest updates about your invested stocks,recommendations from our expert Research Analysts, track yourportfolio etc. Download and install the app now. It is fast,easy-to-use and completely ad free! In case of any queriesregarding the app, write an email to us at [email protected]------------------------------------------------------------------------Track the latest updates of your invested stocks on your smartphonewith the StockAxis App. It covers news on companies listed in BSEand NSE exchanges, Also, track your investments with Portfolio andWatchlist. StockAxis App offers: StockAxis Top 50 Stocks: •StockAxis Top 50 is a list of high ranking 50 stocks rated by ourinnovative and robust StockRating System. • Stocks with higherrating offer a higher probability of achieving gains with a lowerdownside risk. Ease of Use: • Easy navigation to all financialdata, portfolio, watchlist. • Swipe Right on stocks present inChange In Trend, Rating Checkup, StockAxis Top 50, Top 10Industries, Sector-wise Stocks in order to easily add them in MyFavourites or Portfolio • The only App in the Market with the excelview in Analyzer so that you can perform Analysis and Research withconvenience and ease. Analyzer: • Latest quotes of stocks •In-depth market stats like Quarterly Result, Annual Result, BalanceSheet, Cash Flow, Financial Ratio and Shareholding Pattern forstocks • Interactive and historical charts with Line charts typesNews: • News related to stocks; • Listen to the news and articleswith 'Text to Speech' feature • A seperate section of News for yourstocks from Watchlist in Top News Section Media: • 'Media' offersyou past videos of queries related to stock markets answered by ourAnalyst Portfolio Tracker: • Monitoring your Multiple portfoliosacross Stocks • Timely updates on performance of your portfolio,and news relating to stocks you hold • You can export yourportfolio to PDFs and Excelsheets which will be saved in yoursmartphone My Favourites: • Adding your favorite to monitor • Youcan edit/change the number/order of columns in My Favouritessection. Recommendations: • Tracking the stocks recommended by ourexpert Research Anaylsts. Trend/Rating: • Investors would love toknow exactly when to get in a trade and when to get out. TrendSystem identifies the direction (UP TREND / DOWN TREND) of a stockprice movement. The Trend is designed to help you quickly find whento buy, sell or hold a particular stock. • Ratings is a proprietaryrating system of Stockaxis.com which is based on the combination ofboth Fundamental & Technical Rating. Fundamental Ratingincludes various financial data from the income statement, balancesheet, and Cash Flow statement items such as Sales, Profit, AllImportant Ratios, Cash Flows, Working Capital, Cash ConversionCycle, etc. over the past quarters and years. Technical Ratingcomprises of most of the technical parameters such as price,volume, moving averages, MACD, RSI, Fibonacci and many more keyindicators to understand the long term strength of a company. Wehave rating of over 1500 listed companies. Stocks are rated on ascale from 1 to 99, with 99 being the best. StockAxis is India's #1App for performing Analysis and Research on Indian Stock Market. Upstox Pro helps you trade and analyse the Indian stock markets inreal-time. Cutting edge charting tools, and live market data makeit one of the most renowned stock market trading apps in India.Just download and experience the trading app for free. You cantrack and analyse stocks on-the-go. Open a demat account only whenyou’re ready to place your first trade! Key Highlights - -Universal search tool to find simple and complex stocks. - Accessto NSE cash, Futures and Options, and Currencies scrips -Cutting-edge charting tools that are above industry standards -Charts of multiple intervals, types and drawing styles - Apply 100+technical indicators on real-time charts - Trade directly fromcharts with the Trade From Charts (TFC) feature - Set unlimitednumber of price alerts for instant updates - Create unlimitednumber of customized watchlists - Receive real-time market feeds tostay on top of your scrips - Access predefined watch-list of Nifty50 and other indices Why Choose Upstox - - Zero brokerage ondelivery trading and ₹20 per transaction on Intraday and F&Otrades. - Backed by top investors including Ratan Tata, KalaariCapital & GVK Davix. - Fast and efficient trading platforms fortraders and investors who value time. - Interconnected tradingsoftwares that enable you to trade on both mobile and web using thesame account. - Sophisticated charting softwares combined withspeed and reliability. With Upstox Pro you can make the most ofstock market investment and trading. So, just download the app andturn your Android-based smartphone into a powerful stock analysisplatform. Angel BEE is an all-in-one investment app, providing a one-stopsolution for all your mutual fund investment needs. The Angel Beemutual fund app was awarded "Best Mobile App for Mutual FundInvestments of the year" at India BSE - CEO Weekend 2018, organisedby Tefla. The Top features of Angel BEE mutual fund app: - Investsmartly -- Start your mutual fund investment journey in a fewminutes with this cool mutual fund mobile app - Achieve your goals– Define your goals and easily calculate your SIP amount to achievethem - Save on tax – This smart mutual fund app will help you savetax by investing in the best ELSS mutual funds - Earn more – Earnmore on the idle cash sitting in your savings account - Trackexpenses – Manage your money and expenses better with the built-inexpense tracker Why should you invest with Angel BEE investmentapp? All recommendations by the Angel BEE mutual fund app arebacked by ARQ – our hyper-intelligent investment engine which picksout the best funds across Equity Schemes, Debt Schemes, BalancedSchemes and ELSS Schemes. ARQ-recommended schemes have consistentlybeaten the benchmark and top five schemes (by AUM), back-testedover the past seven years. What can you do with Angel BEEinvestment app? 1. Invest instantly with this mutual fund mobileapp: Invest in mutual funds and SIP plans in just a few swipes. Newusers can open an account for free 2. Define your goals and achievethem: Define your financial goals and plan your investments toachieve your dreams. Use ARQ to analyze the SIP amount required toachieve your goal. 3. Track your portfolio with a mutual fundtracker Monitor your external mutual fund investments along withthe investments made via Angel BEE through the Angel BEE mutualfund tracker. Just upload your consolidated CAMS statement tomanage your mutual fund holdings in one place. 4. Earn betterreturns on idle funds: The investment app gives you access to a BigSavings Account that will allow you to make better returns on themoney lying idle in your existing bank account. Withdraw money,anytime, anywhere, 24*7 using the Angel BEE app. 5. Save big ontaxes with mutual funds: Saving tax has never been this easy.Invest in the best tax saving schemes (ELSS mutual funds) withoutany paperwork through the innovative mutual fund app. 6. Planyour budgets and track expenses: Set budgets, analyze your spendsand smartly manage your money with the Angel BEE investment app.The app automatically processes your transactional SMSs andclassifies your expenses into categories like food, shopping,travel etc. Which funds can you invest in with Angel BEE mutualfunds mobile app? Axis Mutual Fund Aditya Birla Sun Life MutualFund L&T Mutual Fund ICICI Prudential Mutual Fund Kotak MutualFund HDFC Mutual Fund SBI Mutual Fund Invesco Mutual Fund RelianceMutual Fund UTI Mutual Fund IDFC Mutual Fund Are there any chargesto avail these services? Angel BEE does not charge any money fromits customers for using the investment app. We earn from thecommission we get from the mutual fund asset managementcompanies. Mutual funds, like securities investments, aresubject to market and other risks and there can be no assurancethat the objective of any of the schemes of the fund will beachieved. Please read the offer documents carefully in its entiretyprior making an investment decision. What are you waiting for?Download the Angel BEE investment app and transform how you investand manage money! Ventura Wealth application is specially designed for Ventura(www.ventura1.com) clients. This application provides real timetrading on BSE/NSE. You can now buy and sell Equity, Derivatives,Mutual Funds, Bonds and IPO using this platform. Live marketupdates will be provided. KarvyOnline mobile app is loaded with special features to help youtrade on the go. Stay in tune with the markets and make the rightinvestment moves at the right time! Simple, fast and highly securedonline trading platform enables you to carry out share markettrading from anywhere anytime. You can do share trading at ease.Stay updated with stock market news and take the right investmentdecisions with highly reliable research reports available on theapp. Get complete hold of all your trading in equity, derivativesand currency segments of NSE, BSE and MSEI stock exchanges withKarvyOnline mobile app. Special Features: • You can open sharetrading account with ease using the app • Monitor your holdingsanytime from anywhere • Track stock activity anytime with Heat Map• Get detailed analysis of stock performance through Scanners • Getaccess to Fundamental and Technical Research Reports • View top 50gainers and top 50 losers in the market • Keep track on bullish andbearish stocks • View weekly and monthly Technical Charts • Chatwith research experts through Ask the Expert • Use AdvancedCalculators to know margins and many more • View all orders- open,trigger pending, complete, rejected, AMO and cancelled orders KnowLast price, Change, Change%, High and Low, Open and Close of yourfavourite stocks • Transfer funds easily • Book Demo to learn moreabout trading platforms • Get access to your Mutual Fund holdings •Get to know the Top performing Mutual Funds • Get information ondividend, stock split, rights issue, etc. • Carry out online sharetrading in equity, derivatives and currency segments through asingle trading platform • Karvy Online Mobile App is easy to useand helps you take charge of your investments with just a tap onyour smartphone. It’s a 3-in-1 app with which you can trade, readreports and also have a clear analysis of stocks’ movement.